This fall Hayden Library is hosting an interactive exhibit called “EarthArt” in partnership with the MIT Department of Earth, Atmosphere and Planetary Sciences (EAPS). An iGlobe, an illuminated sphere, will have a rotating display of maps and data visualizations related to climate and environmental concerns. It will also be available for students and community members to upload their own data and artwork. 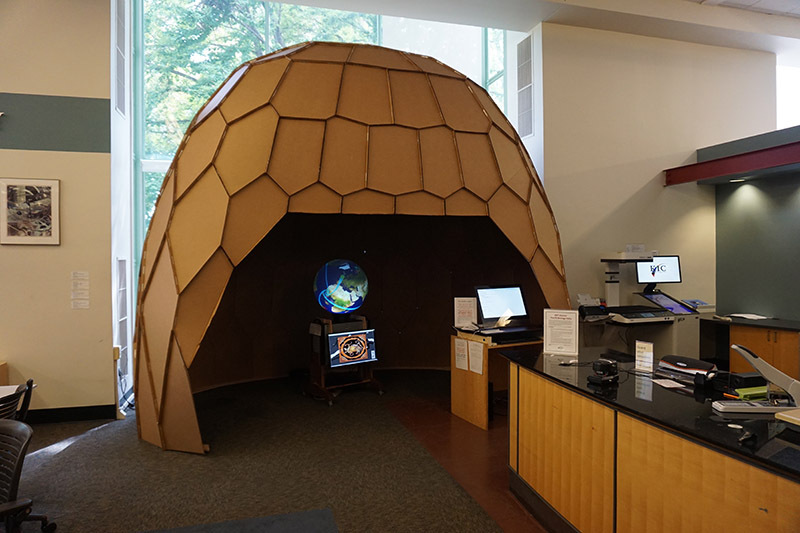 The iGlobe is located in Hayden’s first floor reading room and housed in a custom-made shell designed by Bill McKenna, a researcher and technician in the Synoptic and Fluid Labs in EAPS. Although the emphasis will be on work related to climate and environment, students eager to create any type of art for display on the iGlobe will be welcome to do so. The exhibit is partially supported by a grant from the Council for the Arts at MIT.